TOWN HALL MEETING on impeachment and driving out the Bush regime with speakers and a film showing. 6:30-8 p.m. University Heights Community Center, 5031 University Way NE. CANCER PREVENTION COOKING class: "Antioxidants and Phytochemicals." 10 a.m.-noon and 6-8 p.m. Whole Foods, 888 116th Ave. in Bellevue. Call 425-462-1400 for more information. OUTDOOR FILM SERIES begins 30 minutes after dusk between 9:30-10 p.m. South Lake Union Discovery Center lawn, northwest corner of Denny and Westlake streets. ALL NATIONS CUP opening ceremony with music and live entertainment. 7 p.m. Fort Dent Park, 6800 Fort Dent Way in Tukwila. WELLNESS AND HEALTH TOUR offers free screenings. 1-7 p.m. Walgreens, 4412 Rainier Ave. S.
BICYCLE SATURDAY without motorized traffic from 9 a.m.-6 p.m. from Mt. Baker Beach, 2301 Lake Washington Blvd., S. to Seward Park, 5902 Lake Washington Blvd., S.
FOSTER CAT ADOPTATHON features numerous cats of different breeds. Noon-3 p.m. Garfield Community Center, 2323 E. Cherry St. Call 206-386-PETS for more information. MT. BAKER COMMUNITY BBQ and Potluck. 4 p.m. Bring your favorite dish to share. Mt. Baker Park, 2521 Lake Park Dr. S.
BASTILLE DAY Celebrate French culture with food, entertainment and children's activities. 11 a.m.-6 p.m. Seattle Center, 305 Harrison St.
"FRAMING AND EXECUTION," documentary film on the mainstream media's coverage of Mumia Abu Jamal, death-row inmate, journalist and former Black Panther member. 7-9:30 p.m. Safeco Jackson Street Center, 306 23rd Ave.
COMMUNITY COALITION for Contracts and Jobs meeting to ensure equal participation for African Americans. 6 p.m. CAMP, 722 18th Ave. Call 206-353-5770 for more information. AGE 55+ JOB SEARCH workshop for King County with job counselors available to answer your questions.10:30 a.m.-noon. The Central Building, 810 Third Ave., Suite 150. Call 206-684-0500 for more information. COFFEE HOUR for seniors with Steve Nicholas who directs the city's Office of Sustainability and Environment, which helps households, organizations and businesses use natural resources more efficiently. 10-11 a.m. Central Building, 810 Third Ave., fourth floor. CANCER PREVENTION COOKING class: "Immune Boosting Foods." 10 a.m.-noon and 6-8 p.m. Whole Foods, 888 116th Ave. in Bellevue. Call 425-462-1400 for more information. CONSTRUCTION TRADE CAREERS in carpentry, electrical, ironwork, plumbing, painting and more. 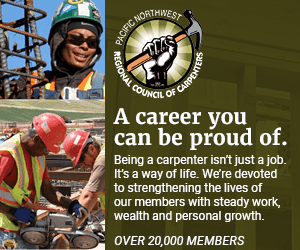 Weekly orientation at 11 a.m. Seattle Vocational Institute, 2120 S. Jackson St. Room 102. Call 206-587-4974 for more information. SKYWAY COMMUNITY CARNIVAL features fun food, games, entertainment, resource fair and more. 11 a.m.-3 p.m. Skyway Methodist Church, 11800 Renton Ave. S.
DISCUSSION AND FILM documentary on solutions for the medical system crisis with guest speaker Dr. Susan Williams of East Harlem Hospital in New York. 7:30 p.m. New Freeway Hall, 5018 Rainier Ave. S. Call 206-722-2453 for more information. PARK TUNES family concert features various local acts. 5-8 p.m. Mt. Baker Park, 2521 Lake Park Drive S. Bring a picnic and blankets.